Castleblack: Wunwun the giant, Tormund and few wildlings save the day as Thorne and brothers of the nights watch prepare to fight against Davos and his few men. Thorne's taken into custody. King’s Landing in the Red Keep: Cersei wants to go see Myrcella’s body. Tommen has ordered his guards to not let his mother see it. The Mountain is with her, looks like there’s going to be a fight, but the guards get upset, turn around and leave. In the Sept: Jamie speaks to Tommen and says he should be understanding of his mother. He seems to agree and leaves while High sparrow and other sparrows surround Jamie. Mereen: Tyrion enters the dragon's chambers, they shoot some fire but calms them by talking to them and unchains them. They are loose but still locked. Bravos: Jaqen H'ghar seems to finally start believing Arya and orders her to follow him. Winterfell: Ramsey talks about going to a war against Castleblack to get Sansa back. Roose contradicts and talks about alliances. Maester comes in and says Lady Walda has given birth to a boy. Roose is buoyant while Ramsey isn't. He kills Roose, Lady Walda, and his new-born brother. Sansa on the run: Sansa says they need to go to Castle Black. Theon says he cannot go because he’s betrayed the Starks so much that Jon will kill him. Sansa says she can explain, but Theon hesitates and says he has to go home. Pyke: Balon walks upon a bridge. He sees a hooded figure on the other end. It's Euron( his brother) who slowly removes his hood. He throws Balon off the bridge. Castleblack: Davos asks Melisandre to try to resurrect Jon. She isn’t confident but agrees anyway. Davos, Tormund, Edd, Ghost are all in the room watching as she keeps chanting and begging to the Lord of Light. Nothing happens. Ed and Tormund leave as they seem defeated. Davos and Mel stay longer but they follow the suit too. Ghost remains with Jon’s body, laid out near his feet. 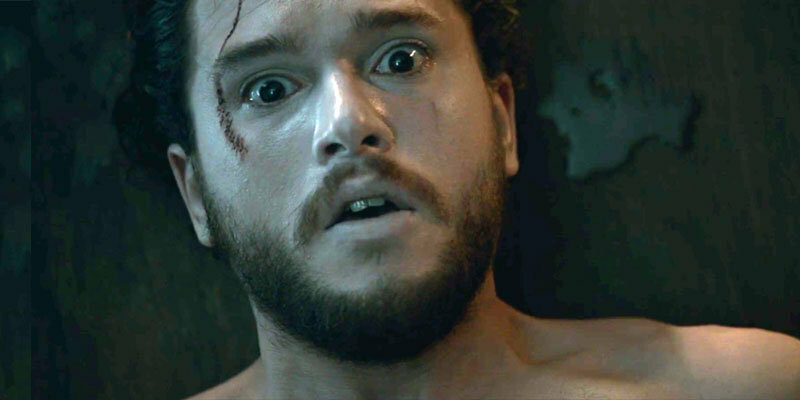 Ghost’s head shoots up, his ears perk up and FINALLY, Jon's eyes open as he gasps heavily 6 times.